My Favorite Supplements, Health Products, Books, and Other Goodies! I am regularly asked what products I use and recommend so I decided to compile a list of my favorite products and share them with you. 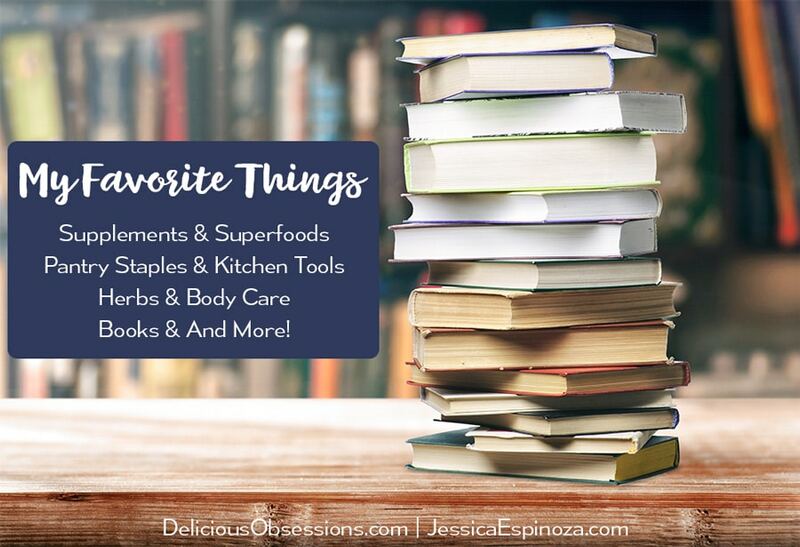 Below you will find everything from supplements to pantry staples to my favorite books and kitchen tools. I only recommend products that I, myself, have tried, loved, and believe in. If I don’t believe in the product or like it myself, it doesn’t get added to the list. If you have questions about products not on this list, please let me know and I’ll look into them! Pharmaceutical-grade probiotic supplement. Produces antioxidants in the gut. First probiotic product that combines three of the world’s most well-studied and widely used strains. A powerful clinically tested, peer-reviewed, shelf-stable, and viable broad-spectrum formula. Highly effective and powerful 19 strain probiotic. The only brand of HCL that I can find that does not contain ingredients derived from pork. Effective and affordable option for HCL (does contain ingredients derived from pork). One of the few brands of enzymes that does not contain ingredients derived from pork. Effective and affordable option for digestive enzymes (does contain ingredients derived from pork). Our PRObiotics need PREbiotics for food. This is my favorite blend of prebiotics to support the microbiome. Bitter herbal formula that is an excellent way to stimulate and enhance digestive function. Pharmaceutical grade broad spectrum vitamin K2 supplement with needed co-factors for enhanced absorption. High-quality whole food C (no ascorbic acid), with natural phytonutrients and co-factors for proper absorption. Highly absorbable B vitamin complex (with properly methylated forms). The glycinate form is highly absorbable, with glycine helping promote relaxation and sleep. Another highly absorbable form of magnesium, with the malic acid helping digestion. Molecularly distilled, burp free Omega-3 fish oil capsules (soy-free). Derived from 100% wild Arctic cod (no other fish oils or synthetic additives are ever used). Includes natural vitamins A & D.
The perfect balanced combination of omegas 3, 6, and 9 for those who may need more balanced support. Concentrated, therapuetic support with double-strength EPA and DHA. The most concentrated, full-spectrum, organic superfruit formula available. A phytonutrient powerhouse with 20+ organic ingredients. The most comprehensive and trusted certified organic green superfood powder in the world with 60+ unique ingredients. The perfect way to get all the nutritional benefits of liver without actually having to eat it! Use coupon code DELICIOUS10 to save 10%. One of the cleanest, most pure collagen products on the market, made from healthy, grass-fed cattle and tested for purity. Use coupon code DELICIOUS10 to save 10%. One of the cleanest, most pure gelatin products on the market, made from healthy, grass-fed cattle and tested for purity. Use coupon code DELICIOUS10 to save 10%. Incredible veggie powders made from organic, heirloom veggies providing key nutrients to support health and well-being. Use coupon code DELICIOUS20 to save 20%. Great for immune support and overall wellness. Muhammad said it is the remedy for everything but death. The link above will give you 10% off. Great for immune support and overall wellness. Muhammad said it is the remedy for everything but death. My go-to source for all things herbs. Organic, sustainably harvested, superior quality. If Mountain Rose doesn't carry it, Gaia is my next stop for quality herbal supplements. High-quality, handcrafted organic herbal products by one of my closest friends. Use coupon code DELICIOUS10 to save 10%. An excellent blend of organic herbs to support proper liver function and detoxification. Use coupon code DELICIOUS10 to save 10%. An blend of organic herbs and superfoods to support proper liver function and detoxification. Organic maca powder in 3 varieties - red, yellow, and black. My favorite matcha brand. Pure, organic, and doesn't break the bank. A must-have for digestive upset, food poisoning, or other types of intestinal distress. A must-have for urinary tract health, taken for acute situations and occasionally for ongoing support. Powerful immune support, especially for those prone to cold sores and other similar issues. Concentrated garlic support for a variety of immune and health conditions. A must-have year round, but especially during cold and flu season for immune support (I love all WishGarden products). A must-have year round, but especially during cold and flu season for immune support. A must-have year round, but especially during cold and flu season. Helps make coughs more productive. Powerful immune support and disinfectant for cuts, scrapes, etc. Herbs, herbal skin & body care, raw ingredients for DIY'ers, and more. Handcrafted herbal skin and body care products, as well as home care items. Clean and effective hair care, including henna, shampoos, brushes, and more. Clean deodorants with no chemicals, metals, or parabens. Clean soaps and lotions with no chemicals, metals, or parabens. Clean soaps, lotions, creams, lip balms, and more, all coconut oil based with no chemicals, metals, or parabens. The best form of magnesium for transdermal (skin) application in order to boost internal manesium levels. My favcorite general purpose cleaner. No toxic chemicals, cheap, and effective. My go-to source for all things herbs and spices. Organic, sustainably harvested, superior quality. My go-to dairy sub for a variety of recipes. Ground up coconut into a fine butter, similar to nut butters (not to be confused with dairy butter). Virgin coconut oil retains the taste and scent of coconuts. Refined coconut oil will be neutral in taste and scent. Delicious and nutritious. A great option for those who may not be able to tolerate much dairy. Used for cooking, salad dressings, and skin care. The key to perfect homemade mayonnaise! I also use for cooking and skin care. My all-time favorite fat (and the only dairy I seem to tolerate). A fun and delicious flour that is also the #1 source of resistant starch to feed our good gut bugs! Classic flour for gluten and grain free baking. What I mainly use as a sweetener since I don't tolerate sugar very well. Great for sprinkling on fruit, salads, trail mix, cereal, and more. Another classic gluten and grain-free flour. Tons of fiber and flavor. Can be used as a 1:1 replacement for regular wheat flour in most cases. My other main sweetener since sugar and I are not good friends. I keep these on hand all the time! Perfect for quick meals on busy nights. My go-to appliance for getting food on the table super fast! A powerhorse of a blender that never lets me down. Smoothies, soups, nut butters, batters, and more. This device is used all the time for blending quick smoothies, creamy soups, or frothy lattes. Compact and easy to store. Perfect for small and large batches of almost everything. Every kitchen needs a good food processor and this is my favorite! Lightweight, super sharp, and easy to use. I use these knives more than any others. Every kitchen needs at least one quality wooden cutting board. Teak & bamboo are my favorites. I use Mason jars to store anythign and everything, both food and non-food alike. Perfect for freezing and storing food from your batch cooking sessions. My favorite frying pans, many of which have been passed down to me from my elders. Keep chlorine and other chemicals off the skin and out of the body with these easy filters. We are designed to squat to eliminate. I recommend every house have a Squatty Potty as a way to help improve our BMs and our health. Everything you need to know about getting started with real food (without breaking the bank!). Learn how to improve your health & vitality with the power of plants! Everything you need to know about this superfood in one beautifully designed book. My all-time favorite book about real food!! An excellent read for those who are planning a family (or may already be pregnant). Herbs are made simple in this beautiful guide to using them daily. In today's hectic world, slowing down around food is key to our emotional, mental, and physical health. Written by my friend and collegue, this is a must-read for those on restricted healing diets. This book revolutionizes the way we think about diets and nutrition. One of the most comprehensive and science-backed books about healthy and unhealthy dietary fats. Best-selling eBook showing you how to make delicious herbal coffees at home to support your health. Everytihng you need to know about getting started with real food and how to prepare mouthwatering meals. Ice cream for everyone, no matter what your dietary restrictions! Finally, fast food on the AIP! This is a must-have for those on restricted diets. For those on the AIP, breakfast is the hardest meal of the day, but not anymore! Create authentic, delicious Latin food at home, no matter your dietary restrictions! Create your favorite take-out meals at home without all the MSG and other unsavory ingredients. An enlightening look at the role trauma plays in our declining physical and mental health. A step-by-step guide explaining how to be more self-compassionate and achieve your dreams in life. This is one book that I want ALL women to read. It will change your life. Learn to embrace vulnerability and imperfection, live wholeheartedly, and courageously engage in your life. A new approach to healing compulsion, with simple exercises and techniques and an inspiring tone. The go-to book on rebuilding a healthy body image and making peace with food. A research-based, scientifically proven approach to letting go of dieting, embracing your intuition, and living a happier, healthier life. Learn what conventional health books get wrong, leave out, and just plain fail to understand about weight. The definitive book of yoga therapy founded in science, history, and clinical experience. A practical guide to yoga and movement for those who are chronically ill, injured, or post-operative. A book for anyone who is interested in mind/body healing and the role yoga can play in that process. Body-affirming yoga for people of all shapes and sizes that helps you feel good about your body, both on and off the yoga mat. Yoga is all-inclusive, no matter what. It's not about how you look, but how you feel. Delicious Obsessions is a participant in the Amazon Services LLC Associates Program, an affiliate advertising program designed to provide a means for us to earn fees by linking to Amazon.com and affiliated sites. Read our full terms and conditions here.